7:00 — 8:00pm Kriat ha-Megillah / Megillah Reading Hear the Whole Megillah chanted by Cantor Ken Rothstein, Rabbi Robin Podolsky, Karen Frimkess Wolff, Brian Pepper, Bernhard Rohrbacher, Rhiannon Castle, Ken Ofgang, Braja Tarletz, and Joe Tepperman. BYOB, Groggers, Noisemakers. Costumes somewhat optional. 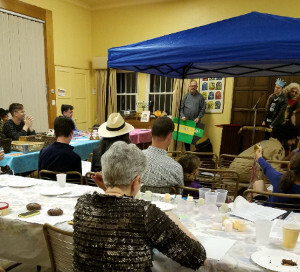 This is NOT your ordinary Megillah reading as the Purim Pranksters put some new twists on a traditional reading of the Whole Megillah – it has that TBI special Hamish flavor. Surprises abound. Michael Kober is back as Purim Extravaganza MC.